I would have snapped it up too! She looks a bit like the actress Mary Pickford, with darker hair. 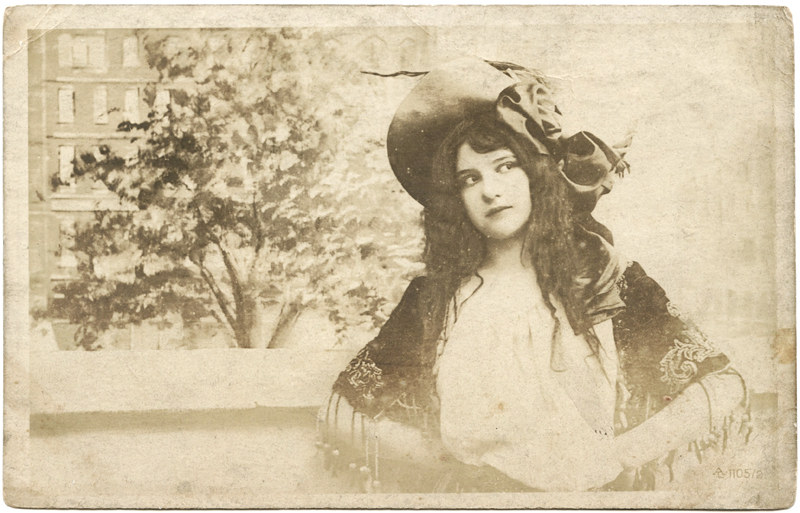 Perhaps she was just one of a number of models employed to make pretty postcards, rather than a performer? I don’t know anything about the publisher, so perhaps they only used “stars”? You are probably right – this pretty lady could have been a model. 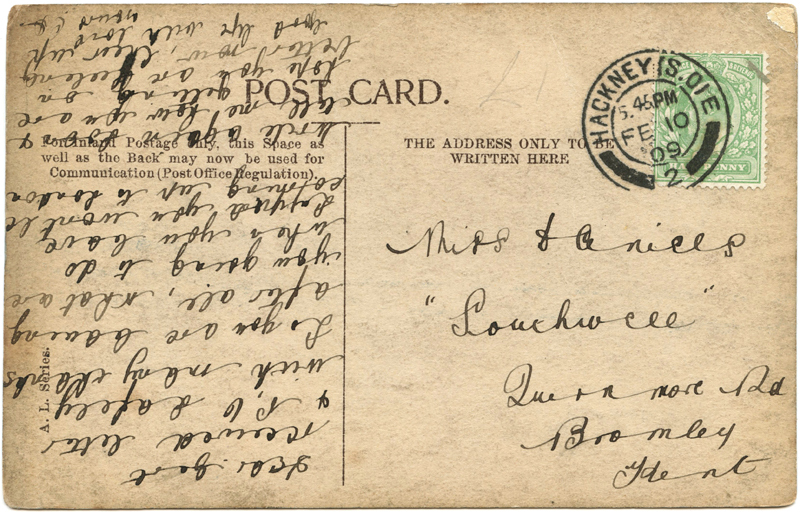 I tried to find out more about this series of postcards but hit a few brick walls. Perhaps a collector will find this blog post (fingers crossed!). A gorgeous and very engaging card. The model’s sideways stare is very hard to fathom – very theatrical- as are the hands which are so underexposed in the print and subsequently faded as to be unreadable. Is her right arm behind her back? Is she meant to be holding a letter with a faraway look on her face as she thinks of the sender? The background is fascinating…is it a real streetscape behind the parapet or balcony on which the subject poses or is it a studio set, with the branch from a tree (with rather wilted leaves) placed to partially conceal the cardboard-cutout buildings behind? Such an intriguing photograph! I’m happy you find the card as thought provoking as I do. And like you, I’m drawn to the unusual background, which I first thought was real, but having studied the card close up, I’m leaning towards a back-drop. Hmm. It could be a wall hanging. So hard to tell though, because of the exposure level. Cleverly done, and artistic photography whatever the truth is! Thanks very much for your comment!